Some small exhibitions currently at the V&A examine images associated with children’s literature: A Fairyland of Flowers compares the illustrations of Beatrix Potter with those of Cicely Mary Barker; Capturing the Imagination: British Fairytale Illustration 1860-1940 provides some examples of artists’ images used to accompany fairytales, while Alice in Popular Culture shows the proliferation of Alice in Wonderland references from spin-off books to films and comic strips. Of course, children’s books are so much about the juxtaposition of image and text, and how the two work together to capture the child’s imagination, but these small exhibitions demonstrate how much they appeal to adults, too, and not just for nostalgia. 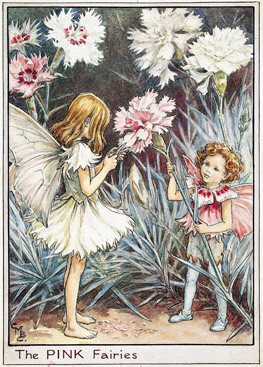 I remember Cicely Barker’s Flower Fairies from my childhood (I think they had a 1980s revival, though originally from much earlier in the century), but it’s striking how twee they look next to Potter’s more serious and botanical drawings. It is interesting, though, to see how childhood and nature are closely allied in the idealised child-fairies of Barker’s images, providing a kind of rural-mystical idyll. The fairytale illustrations, by contrast, are in many cases quite sinister – and more so the closer you look. 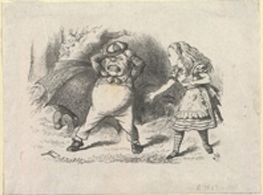 As an adult I have a fondness for Arthur Rackham’s drawings, but as a child I remember finding them slightly threatening; they, like the other images here, show the barely-hidden menace of fairytales and their pervasive significance in modern society; likewise the other illustrations here, including Richard Doyle and Walter Crane. 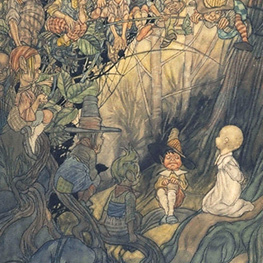 Even this image by Charles Robinson of goblins talking to a stolen child, is implicitly detatching the child from the security of home, surrounded with strange creatures and the darker recesses of the wood. Actually, in this exhibition when the images are shown as a moment frozen in time and detatched from the context of the happy-ever-after ending, the menace is all the more evident. Alice, of course, is a hot topic at the moment (and I am looking forward to seeing the film soon). This tiny exhibition – only two cases – gives a glimpse of the huge impact of the books written by a Victorian mathematician to entertain a young friend; appearing in Batman comics, in Little Nemo, in graphic novels, and influencing songs (even The Beatles), films and even a Vogue fashion shoot in 2003. A political parody from 1939 called Adolf in Blunderland amused me, while A Child Like Alice, from 1950, turns Alice into an instruction manual for Catholic children. Perhaps the nonsense in Alice permits people to see what they want to in the books and to turn them to their own purposes.